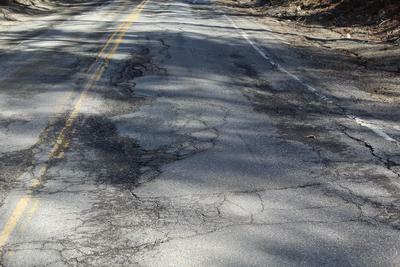 While some potholes have been filled or patched, Southern Bay Road in Penobscot still presents a challenge for drivers. March is a good time to talk about roads. As potholes, frost heaves, cracks and crevices make an annual appearance, it makes one wonder what road projects are in store for the coming year. The Maine Department of Transportation keeps a three-year improvement plan on file that shows the work slated for the state-maintained roads in the coming years—searchable and viewable in a variety of formats at maine.gov. Below are projects scheduled for the next three years, beginning with 2019. On Route 199— Light Capital Paving (is a 5/8” overlay) beginning at Route 166A in Castine and extending 10.44 miles through Penobscot to Route 15 (at Front Ridge Road). Cost: $431,172. Route 166A— Light Capital Paving beginning on Route 166 and extending north 4.14 miles to the north intersection of Route 166. Cost: $170,982. Castine Road—Surface and base maintenance: backing up hot top with gravel. Cost: $62,000. Western County Road—Ditching and replacing culverts at 0.20 of a mile east of Route 175. Cost: $46,000. Route 176—Ledge removal at locations beginning on the Mines Road in Sedgwick and extending north 3.51 miles. Cost: $35,000. In the years 2020 and 2021, the MDOT’s work plan is not as firm, as budgeting issues and changing priorities can impact work listed. Light Capital Paving is slated for Route 175 (Brooksville, Penobscot, Sedgwick) beginning at Snow’s Cove Road and extending north 14.58 miles to Route 166 and a culvert replacement located .16 miles south of Route 175. Currently the MDOT does not have any work scheduled in Castine for those years.